First off, if you're looking for an All in One that can run on a battery, look no further. The IdeaCentre Horizon 27 is the only one. As it stands, the Horizon feels like a prototype device that has the benefit of also being a nice-looking All in One that can lie flat. Lenovo's release of the decidedly forward-thinking 27-inch IdeaCentre Horizon makes it clear that part of this PC-builder's strategy is to push the envelope both in terms of form and function. Given how rapidly the tides are changing around traditional PC builds, this seems like a sound strategy. The more we hear the phrase "post-PC" (insert the words "era" or "world" at your discretion), the more it seems likely that hybrid, multi-function devices like the Yoga or this table-top system will play a key role in this future. The beauty of a progressive hybrid system like the Yoga or this system is that, if designed properly, they can work well in basic modalities, even if they only achieve marginal effectiveness in the more experimental aspects of their existence. This is precisely the case with the Windows 8-based IdeaCentre. Lenovo calls it a table-top PC, and the system lives up to this—conceptually at least. It's capable of standing straight up, but can also lie flat on its back. To drive home the intent of this form-factor, the system comes with a number of games, peripherals and accessories. We're talking board games, electronic dice, a custom touch interface, and more. 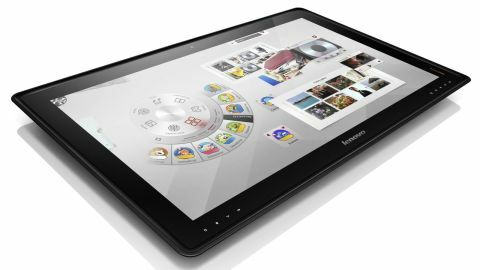 After testing the Horizon for a few weeks, however, we found ourselves hard-pressed to imagine circumstances where we'd reliably use this system in table-top mode instead of a more conventional tablet. The heft and size of the Idea Center compounded this sentiment. But, as far as All in One systems go, the Idea Center is top-notch, with a gigantic, beautiful screen and a fair price—even if the performance is average at best. So how does it all balance out? Let's get into the specs, performance, and usefulness—real, potential, and otherwise—of this forward-thinking but unorthodox system now.